If you follow Linda and I, you’re starting to get to know us by now. I think you know I’m a huge fan of using the herbs in my garden. I have wanted to post pictures of my beautiful gardens, but to be honest, the rain has been overwhelming this summer and our weeds are a constant battle. The plants are beautiful, but so are the weeds. Lol! Linda visited last week and I gave her a tour of the gardens, so perhaps she will comment on all the beautiful plants growing. 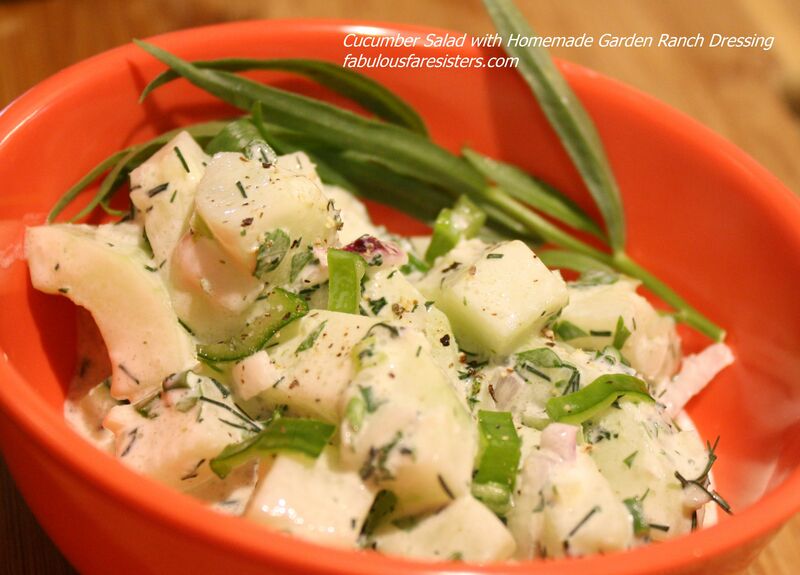 Since I love a good cucumber salad, today I used herbs and onions that I picked in the rain. Peel cucumbers and spoon out seeds. Chop herbs and garlic, add sour cream, vinegar and olive oil and mix. Chill and eat! Oh so delicious and fresh! I will definitely make that someday over a nice chicken briyani! Thank you I was looking for something like that since long.very fresh and delicious Lind! Lucky you with a herb garden! Thanks Lola. It is very refreshing. If I make it for a crowed, I do use a little less garlic, but for me I use more. This looks delicious! And so appropriate for summer. No worries, I’ll bring you some next time I see you. Love you too!